My daily makeup I can't do without through this heat wave time of summer. Each of these have a fighting power that the glaring sun and melting heat can't win against. 1. Fresh Sugar Rose Lip Treatment: super hydrating with SPF 15 while leaving your lips a lush rosy pink. 2. Tarte Cheek Stain in Loving (c/o): skip the powder blush! Tarte's gel cheek stain in its new pinkish/coral color is flattering for any skin tone. Non-drying, won't clog your pores, and lasts through the hot day. 3. Benefit They're Real Mascara (c/o): separates, curls, defines, yet thickens my straight, short eyelashes and doesn't leave a smudge at the end of my day. Best mascara discovery, ever. 4. Make Up For Ever Full Cover Concealer: My HG concealer. Waterproof, sweatproof - just stays. And covers. What it's meant to do, so your blemishes don't magically appear when happy hour rolls around. I wear Ivory 6. 5. Per-fekt Lip Perfection Gel in Hollywood (c/o): A truly different, long-lasting lip stain that leaves my lips silky and hydrated with a berry-kissed pucker. Non-drying and no sticky feeling. Finishes off a perfectly au naturale summer look. 6. Bobbi Brown Pot Rouge in Calypso Coral: a multifunctional cream blush and lip cover. It's a bit drying for the lips so I strictly use this for the cheeks, which is beyond amazing. Little goes a long way - just a dab of blush onto your fingers and a pat onto your cheeks - natural looking flush for days, even in a humid 100°F weather or through the ocean waves. And you know what? I did NOT anticipate the sun and the hot, dry weather messing up my hair this bad, so stay tuned on my next summer beauty segment on haircare and how Bangstyle's new product line comes to my distressed hair damsel's rescue. 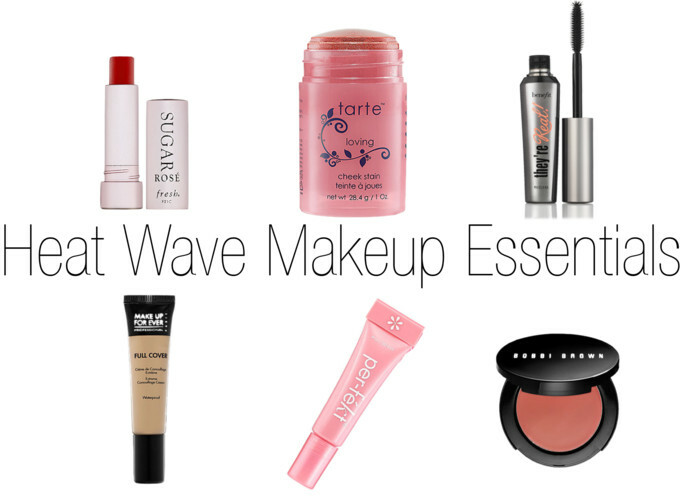 Have any heat wave makeup saviors of your own? Share in the comments! Tarte's cheek stains are the best! I love how multipurpose they are, too - and all natural! I'm going to have to check out that lip stain, though - it sounds divine! Hmm, so this is what I wear when our city is 106 (like it is right now)... I wear: Bobbi Brown concealer, Clinique mascara, Bobbi Brown shimmer brick on the apples of my cheeks, Bobbi Brown bronzer everywhere, and MAC lipstick. That is it. Too hot for anything else and all the other stuff would just slide off anyway! Wonderful recommendations doll. Im trying the Make Up Forever concealer as soon as I finish the others I have on the go right now. I've been wanting to try the Make Up Forever concealer but I haven't quite been able to find a shade that matches my skin! !